When Paul O’Neil was still with the Cincinnati Reds he was not yet the player who led the New York Yankees during their 90’s Dynasty Years. Instead he was pressured by then manager Lou Piniella to pull the ball as often as possible in hopes that he would hit more homeruns. The results were mediocre. When the Yankees traded Roberto Kelly (my favorite player at the time) for O’Neil, I was quite mad about it. I would have bet anything at Sportsbetting.ag that the Yankees had just set back their re-building project by several years. I soon learned that Paul O’Neil was a much better player than I realized. The Yankees freed O’Neil to return to an all fields approach. Now Paul O’Neil is a treasured Yankee and is remembered as a great player. I do not mean to suggest that Drew Stubbs will magically transform into the modern day Paul O’Neil (Ryan Braun?) now that he is in Cleveland. However, I do think he is a better player than the one the Reds basically threw away. The Reds tossed the Indians a player that was nearly without value at the plate in 2012. Stubbs batted just .213/.277/.333 last season. He walked less and struck out more. He hit more groundballs and infield flies and his lowest line drive rate ever. It was the worst season of a young player’s career. Stubbs has a long swing that causes him to struggle to hit breaking pitches but especially the curveball and the changeup. He swings at fewer pitches out of the zone than most players but he also makes worse contact when he does. He also swings at fewer pitches than most players both in and out of the zone and makes worse contact. Stubbs was drafted in 2006 out of the University of Texas. He was drafted just after players like Evan Longoria and Clayton Kershaw and before Tim Lincecum. According to Baseball America he was considered the best athlete, best defensive player, second-fastest base runner, and third-best power hitter among collegians. With a little tweaking and some hard work the Reds might have made Stubbs a better player before graduating him to the majors. Apparently the Reds were happy with Stubbs as he was and rushed him through the system in just over two seasons. He was placed into the hands of a manager who seemed to have little patience with young players. Since his call-up, Stubbs has displayed an excellent glove in center field, homerun power and a bunch of stolen bases. He has never hit for average in the majors (and did not do it much in the minors either) but his decent walk rates made his on-base percentage acceptable when combined with his other skills. Fantasy owners had no problem with his .250-.260 batting average because usually it came with around 15 homers and 30 stolen bases. 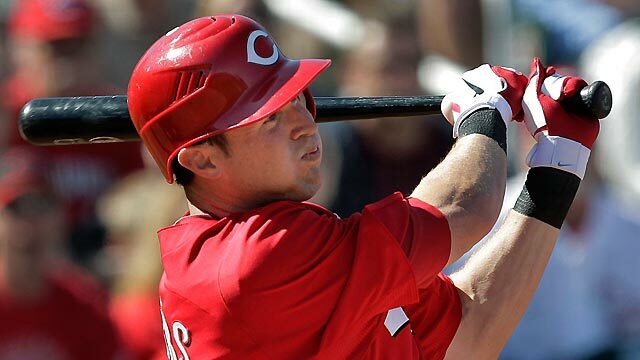 But just like the Reds, fantasy owners abandoned him in droves when his average fell to .213 during the 2012 season. As a player with both power and speed Stubbs can be expected to have a slightly higher than average BABIP and his career .323 BABIP fits. In 2012 his BABIP was just .290 which may be around average for most players but not for Stubbs. If nothing changes but his BABIP returns to the .330 level, Stubbs should have stats that resemble his 2010 and 2011 seasons. Hopefully is walk rate will rise back to its former level. His linedrives return and and he reduces those infield fly balls. The Indians would probably be happy with that. But if the Indians actually put some time in with Stubbs and worked on shortening his swing and improving his approach at the plate he could be even more than he was with the Reds. He could be the Cleveland version of Paul O’Neil.